IP Door Access Control Systems are easy to install and provide excellent flexibility, yet many people who are used to the older type systems have concerns about using them. This article tries to take the mystery out of network attached door access control systems, and describes how very easy they are to install and use. You will find that all the signals that were on multiple wires, are now encoded on the single Ethernet network cable. They are just as secure as the older technology. Here’s how they work and how to install them. In the past door control systems included door readers at each door and a central control box. It was basically an analog system with many wires running between the central control box and the remote door readers. The control box supported a maximum number of doors, so we usually tried to install the complete system at one time. It was hard to add additional doors, especially when we exceeded the maximum for the control box. These new Isonas IP door readers are much more flexible. You can install a single reader and then incrementally add readers whenever required. There is no (practical) limitation to the number of readers on the network. The IP readers are really small computers and contain the same (or more) intelligence than the central control box. This door reader/controller stores all the information about the people using the system. The reader makes decisions about status of the door, decides when to unlock the door, and what time of the day a credential can be used. Since all the information is in the reader, it will operate even if the network is down. A standard Windows computer running Crystal Matrix software is used to enter all the information about the people and the badge/credentials. The software allows us to set up who, when, and where people can enter. Once the information is entered into the computer the information is sent to the door reader. 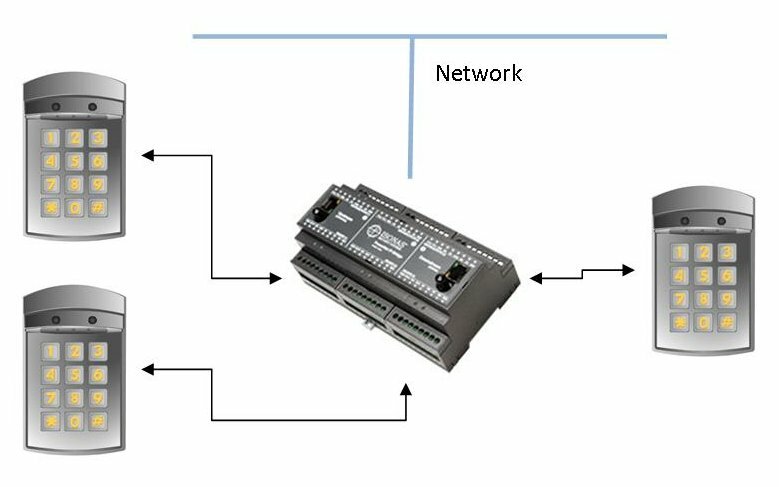 The new IP reader use network wire and connect to a network switch. In many cases there is network infrastructure in place, so all we need to do is run a network Cat5 to the nearest switch. We don’t have to run wires all the way back to the home base. Network Connection: The Isonas reader uses PoE (or 12 VDC) so in many cases all we need to do is run a network wire from a switch that includes PoE. Once the IP reader is plugged into the network, we can set the IP address using a software tool called “PlugNPlay”. We set unique the IP addresses for each reader just like any other computer on the network. Once the reader has an IP address, it can be seen on the computer using Crystal Matrix software running on your Windows computer. Pigtail to the door: The IP reader also has a set of wires that include all the signals needed to control access to the door. This means we don’t have to run the door sensor wire, AUX, or any other control wires back to the control box; they all go right to the reader that’s at the door. It’s very easy. The reader also includes 12 VDC output power that can control most electric locks. It has a built in relay to control the door. As long as the electric lock doesn’t exceed 600 ma of current at 12 VDC, you just run the network wire to the reader and you’re done. Nothing else is required. What about security? What happens if someone hits the reader with a hammer and breaks it off the wall? How do we prevent someone from shorting the wires together and opening the door? Well, there is a special External Door Kit (EDK) that is placed on the secure side of the door. The door reader then communicates with the internal EDK, using an encrypted signal, to remotely control the door relay. There is no way for anyone to break in using the wires at the reader. What do you do if you already have an existing door control system, and would like to add additional doors? Or maybe, you have a new building and would like to add access control to those doors. There is another device available from Isonas that can convert any reader that uses Wiegand connections to IP connections. The IP Bridge is available in a 2 reader version and a 3 reader version. This allows you to place this converter close to the readers and limit the wiring required. Crystal Matrix software runs on your Windows PC. It allows you to define who (each person associated with each badge/credential), when (the person can enter), and where (what doors they can use). The software allows you to define who can access and control the system, define each door, define and set up groups, and define a shift. This is very flexible yet powerful software that allows you to easily set up the system and enter the people assigned to each card (or credential). Here are some examples of the things you can do. Each reader can be given a name so it is easy to find in the software. The IP address can be added so that the software knows where all the readers are located. Users (the people who use the system) can be assigned to groups, and then that group of people can have the same permissions for entry. Now you can tell the system that the group has access to a specific door and control when they can enter the building. There is an easy calendar that can help you define the “shifts” for your organization. You can name shifts so that you can easily identify them. For example, the “weekday shift”, or the “night shift”, etc. In this way you can lock the doors after a “shift” or open them so that badges (cards, or credentials) are not needed. Each person can be entered and assigned to a group. You can enter the badge number for the person, or simply swipe the badge using a reader. It’s easy to add, modify and delete users. IP door access control systems are similar to the older analog systems, except they are just wired differently. Instead of using a wire harness, you can use a thin easy to install network wire. Since many organizations already have a network infrastructure it reduces the length of wire runs dramatically. For more about IP Door Access take a look at our video. If you need help defining, specifying, or installing an IP door control system, just contact us for help. We can be reached at 800-431-1658 in the USA, or at 914-944-3425 everywhere else; or just use our contact form.